It may sound surprising, but it is possible that you can be found responsible for a car accident even if you were not the person behind the wheel when the accident occurred. Not only that, but you may be found liable even if you were not physically at the scene when the incident occurred. Many find this to be hard to believe, however, there are circumstances where this can be the case and knowing just how they could occur may help you in deciding just who is at fault in this situation. Whenever an employee is involved in an accident while fulfilling their job duties the law is made clear that employers are the ones held responsible for any negligent driving or any wrongful acts committed. 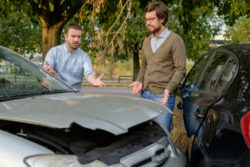 The law is able to hold one party accountable for the actions of another, and when two separate parties have a specific relationship such as employer and employee the employer can be held responsible under the theory of “imputed negligence” or “vicarious liability.” So if an employee is making a left turn while making a delivery for a company and they hit another car who was traveling straight through the light the employer is the one who will be liable for this type of collision. There are certain states where the person who owns the automobile is responsible for any negligent actions taken with their vehicle as long as they have given that person permission to drive their car. In these states, it does not need to be a relationship such as an employee and employer. Once an owner gives another person permission to drive their vehicle the owner is immediately responsible for any activity that occurs afterward. 1.) The “family purpose” doctrine– This doctrine states that when someone buys a vehicle for general family use (usually one of the parents) the owner of the said vehicle will be responsible for any negligent behavior committed by anyone in the family who was responsible for the incident. 2.) Negligent entrustment– If either parent allows their child to drive their vehicle despite being aware that their child is inexperienced, unqualified, or incapacitated the parent can be held responsible for their actions. 3.) Signing the driving license application of a minor– Some states make it where any person who signs the driver license of a minor is the one responsible for any negligent actions committed while the minor was driving. Specifically, in California, a parent can be held civilly responsible for any and all damages that occurred where express or even implied consent to be allowed to drive the car was administered to a minor who is involved in an accident. If you loan your car to an unqualified, unfit, or reckless driver and because of their negligence they are involved in an automobile accident you will be responsible for the consequences of said accident. In what is called “negligent entrustment” the person involved in the incident will try and prove that the driver was incompetent at the time permission was given to drive the vehicle. Examples of unqualified drivers can be an unlicensed driver, an underage driver, an intoxicated driver, a physically or mentally ill driver, an elderly driver, or an inexperienced driver. All of these are instances where the owner who lent out their vehicle would be at fault, for loaning a car in these types of situations proves that the lender is guilty of negligent entrustment. Knowing who is responsible for a car accident can be a confusing process and you will want an experienced lawyer to help show you the best and quickest way to get compensated. Contact the Paris Law Firm at 909-469-5127 or via our online contact form to schedule an initial case evaluation.